Viggo and I set off at nine this morning. 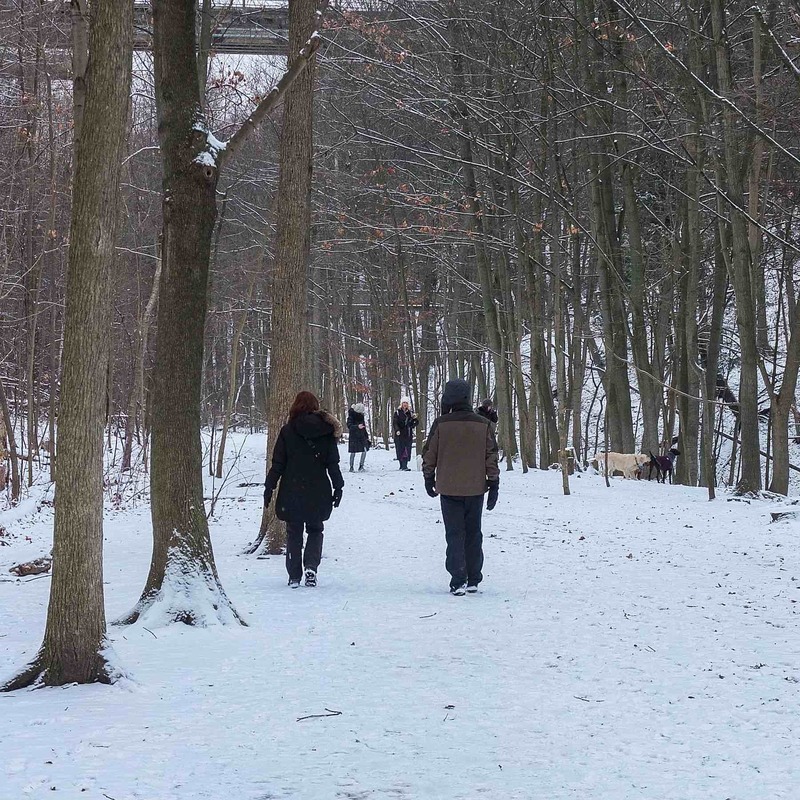 A very light covering of snow and a temperature around 0ºC promised to make for a very pleasant walk. 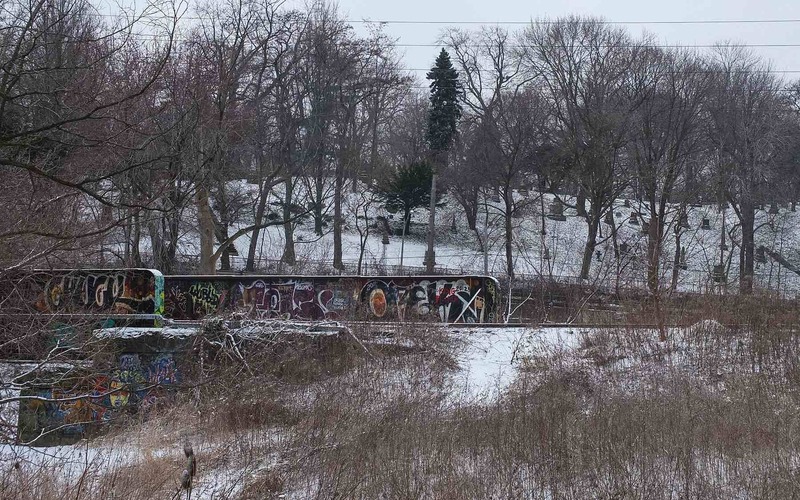 We headed for our customary a.m. ramble – a walk down the Broadview hill to the Riverdale footbridge. My Fuji X10 came along; it hasn’t seen much use in the past three years as I have turned to various Sony cameras, both DSLR and compact to capture my pix. They all have aps-c sensors as opposed to a much smaller sensor in the Fuji. The Sonys produce sharper images and have none of the post-processing issues associated with the raw files from the Fuji X10. 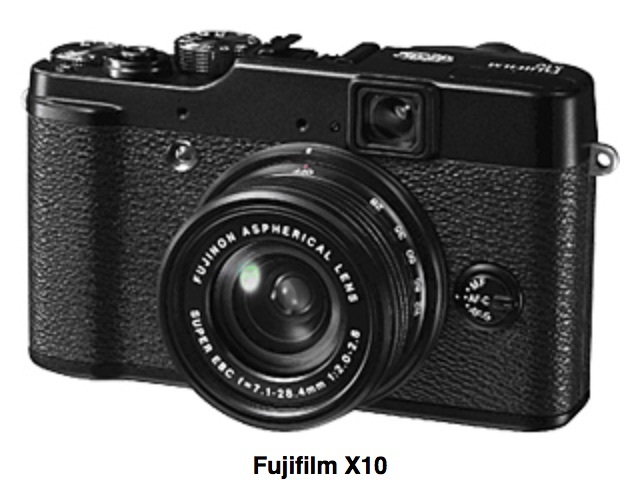 On the plus side, the X10 is a bit more compact and it has an excellent built-in Fujinon lens with a 28 to 112 mm zoom. It is also a beautiful camera to look at and it is just fun to use. 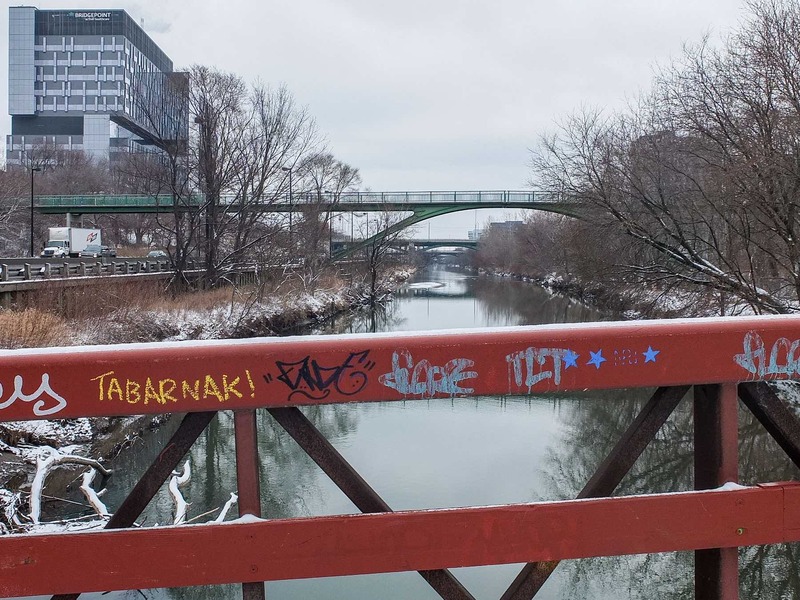 From Broadview Avenue, the Don Valley stretches from south (on the left side of the pic) to the north. When we got down to the footbridge, I decided we’d go down into the valley itself for our walk instead of our usual walk along the fence up to the Adult Learning Center. 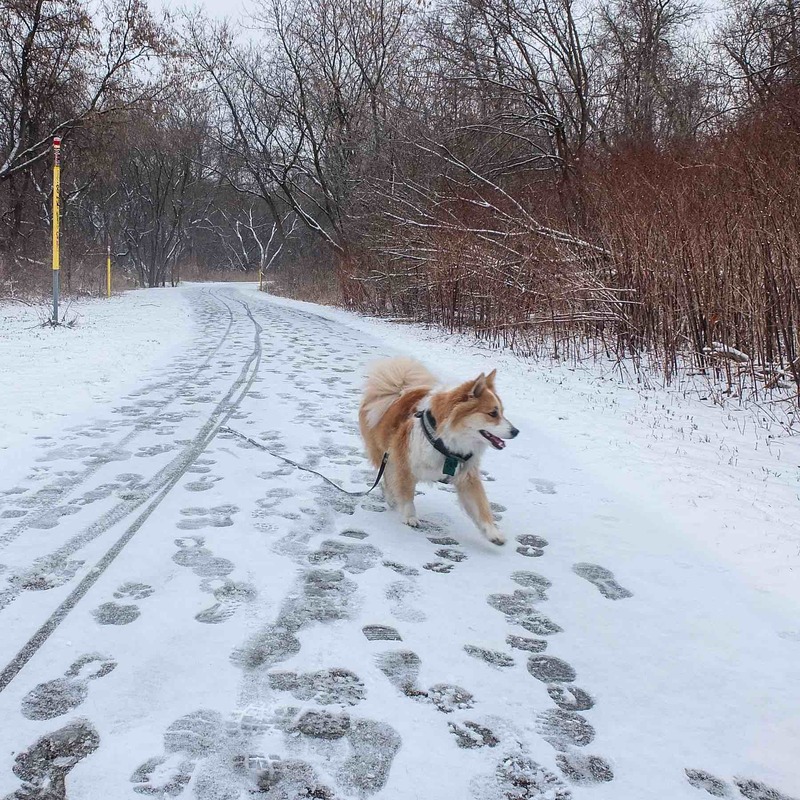 The snow covering meant that there would be less bicycle traffic down there – a good thing given Viggo’s chase drive. 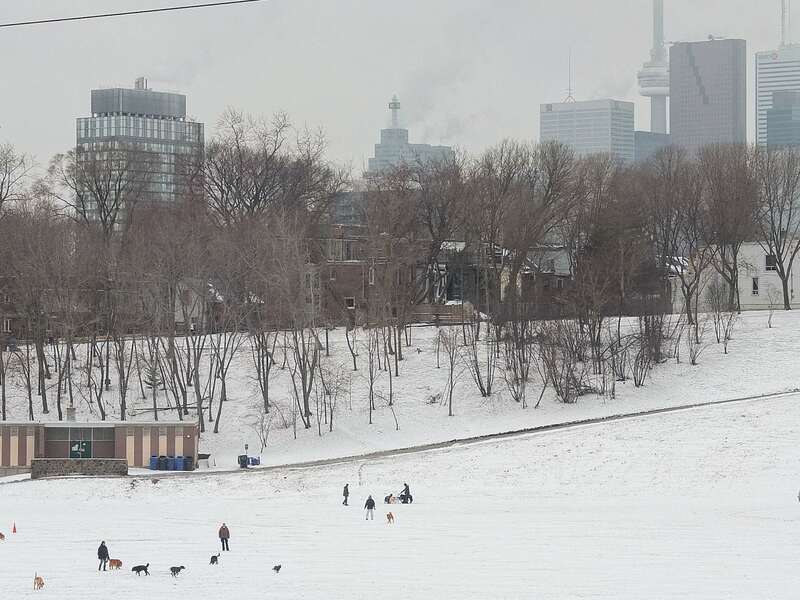 From the green footbridge, I looked over to the off-leash dog area in Riverdale Park East. A dozen or so dogs were at play. 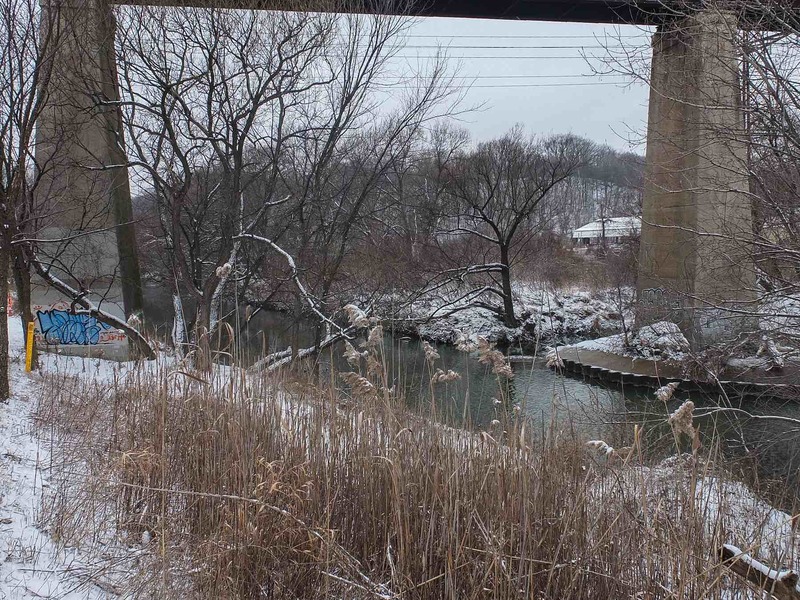 We went down the steps of the bridge to the trail on the banks of the Don River and headed north. 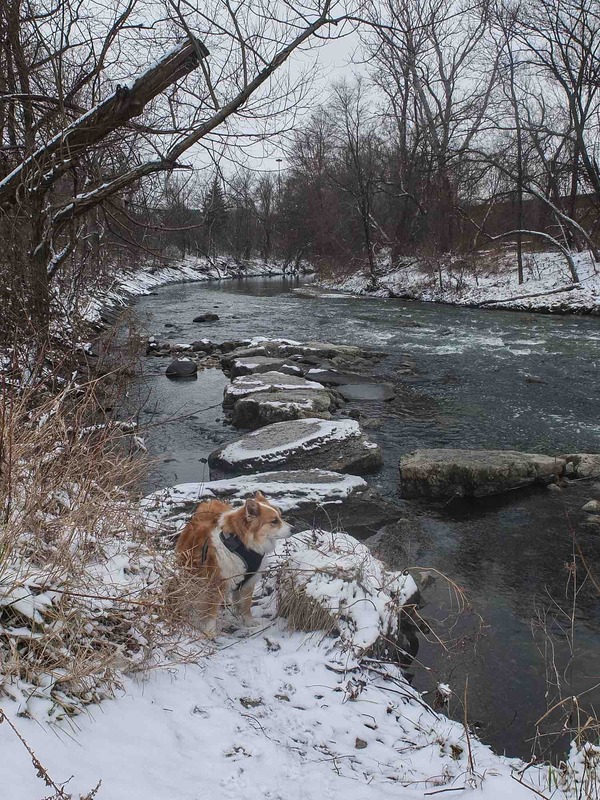 As we walked up the valley – Viggo off leash and free to check out things he figured needed to be – I decided that we’d take advantage of a beautiful day and walk all the way to the Brickworks area and up the Mud Creek Trail to Moore Avenue. It is perhaps my favourite city walk. Given the total absence of sunshine in any of my pix, you’ll probably be wondering what was so alluring about the mostly brown and white scenery we got to be in for the morning! The thing that makes me smile is that we are walking near the downtown area of an urban sprawl of six million and often are able to forget that fact! 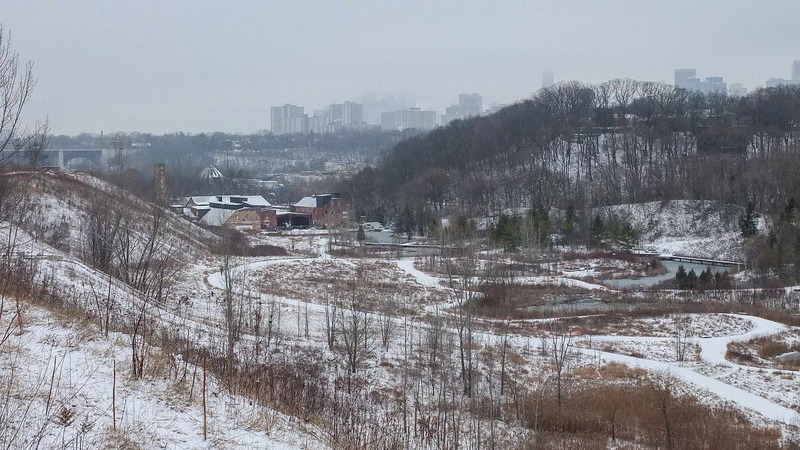 Once at Pottery Road, we headed west to Bayview Avenue and then via a short-cut, up to the ridge over-looking the cavity created over a 75-year timespan by the Don Valley Brickworks. The view from there is always a “wow”. Down below is the Brickworks and the three artificial ponds created about 20 years ago when the city turned it into a park and bird sanctuary. On the horizon is downtown T.O. The overcast and somewhat hazy conditions this morning gave it a special feel. From the ridge it was down to the Mud Creek Trail, taking some time to frame a few shots of the creek as Viggo sniffed around. 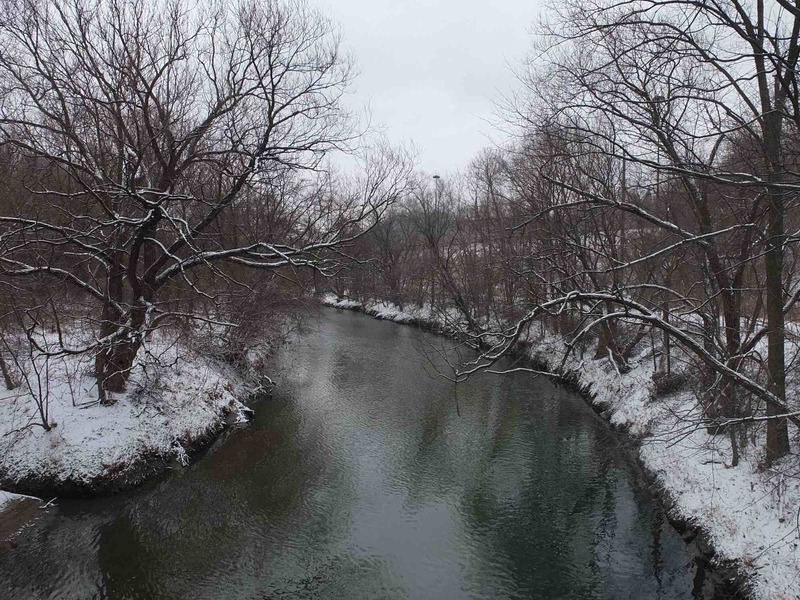 It was the water from this creek which, when mixed with the top-grade clay deposit closer to the Brickworks, provided the ingredients for the bricks that (it is said) built half of Toronto back in the day. 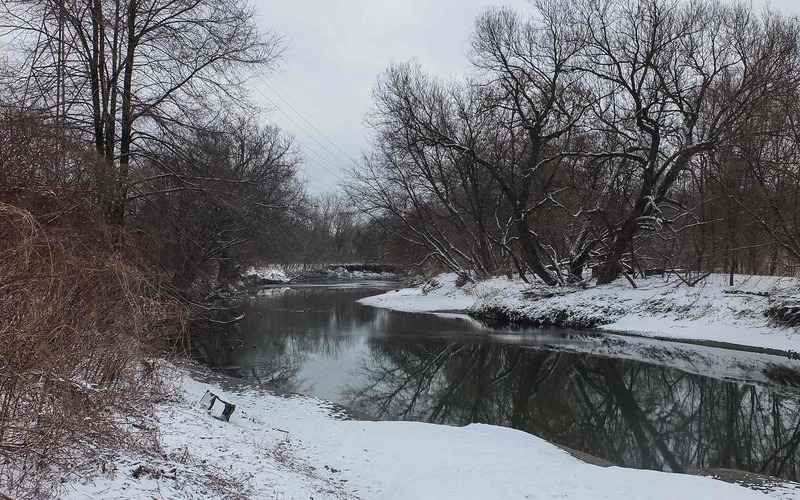 Now Mud Creek flows down into the artificial ponds and then continues on its way to the Don River a bit to the south. As we walked under the train trestle in the pic below, a CPR train happened to rumble overhead. Unlike a number of the other tracks we walked over or under, this set is still at work! 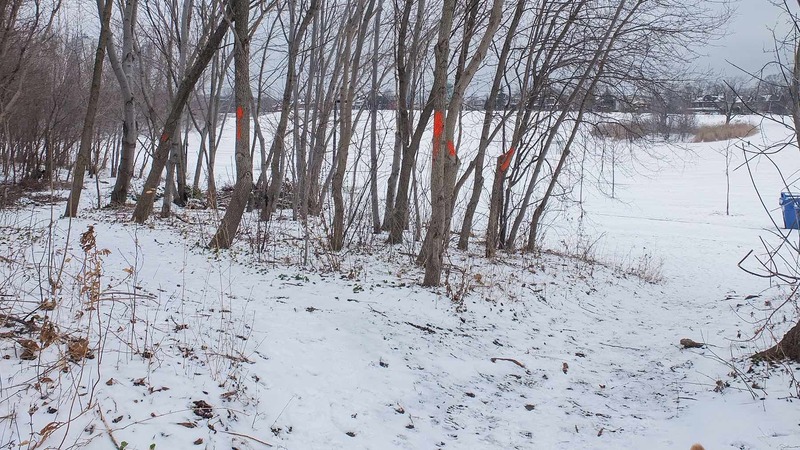 As we came up to the north end of our walk, I noticed a number of trees with red dots on them. 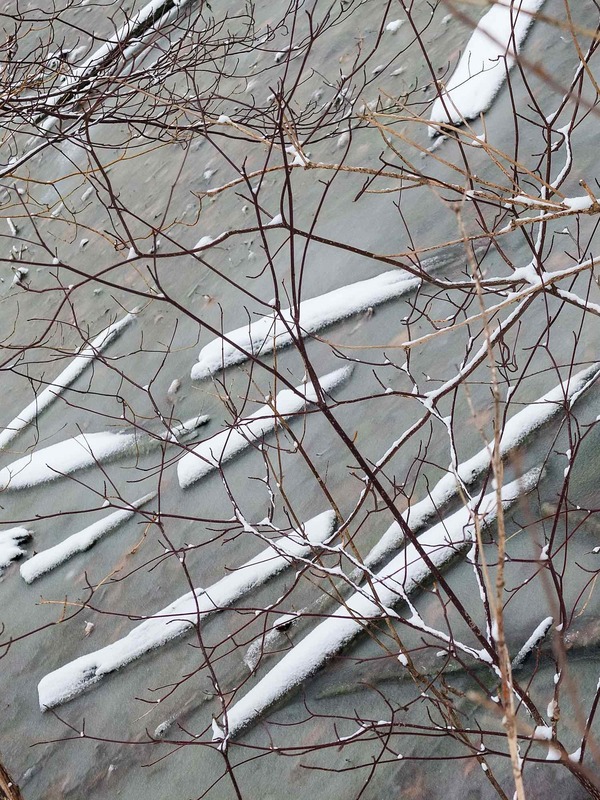 I have seen similar markings on some trees in our neighbourhood. I figured it meant they were to be removed because they were dead. I would soon find out the full reason. 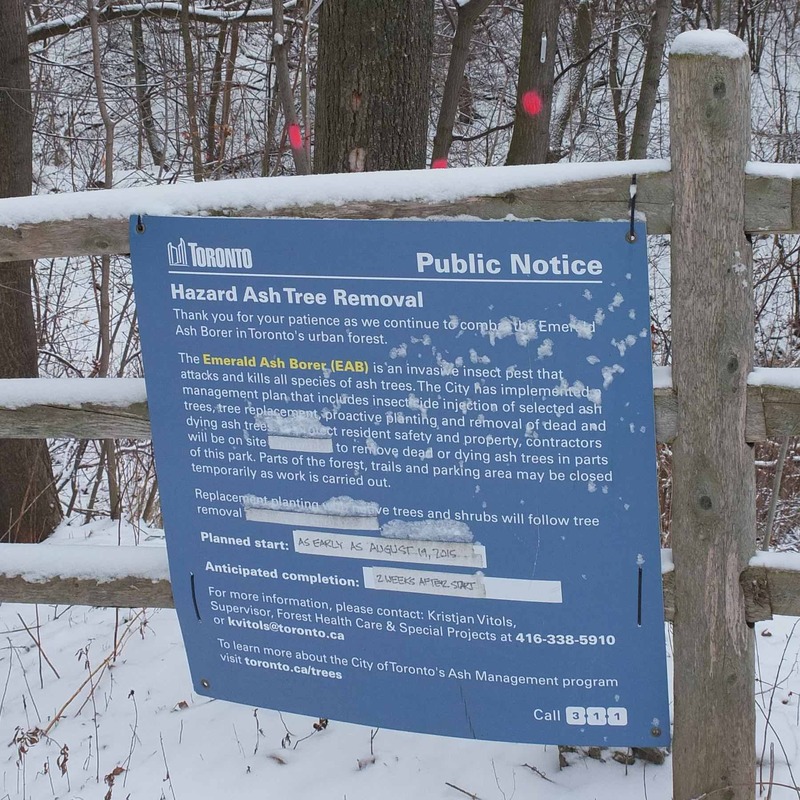 Ash Tree Removal Sign – Now I Understand the red dots! A full explanation of the red dots in front of me, I still had to laugh at the urgency given to the project by the City. The planned start reads “August 14, 2015”. The City workers’ motto of “as much as we have to, as little as we can” came to mind as I calculated how much behind schedule they were. 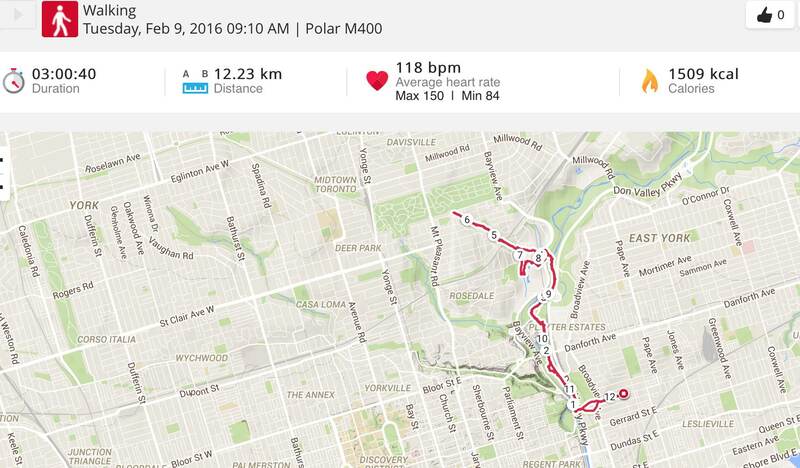 Looking at my GPS watch I noticed that we had walked six kilometers since starting out. In front of us was Moore Avenue. 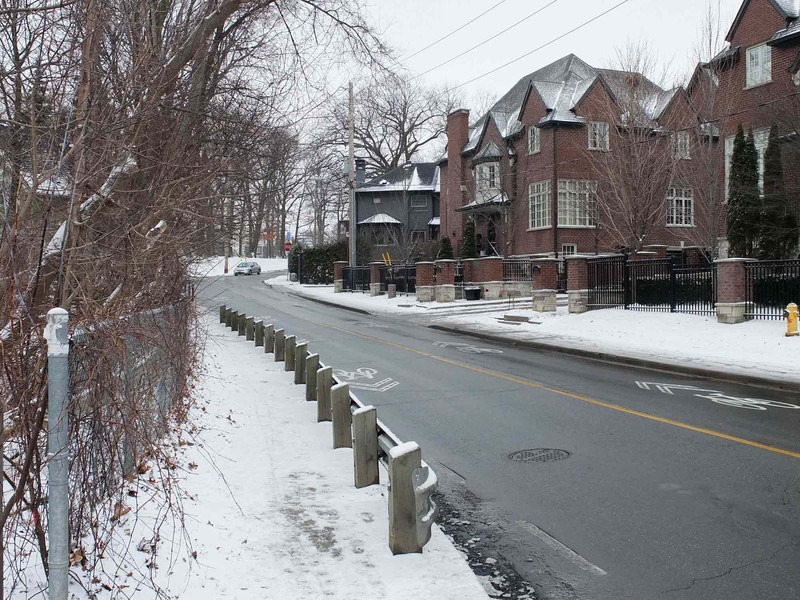 Behind the houses is Mount Pleasant Cemetery. We would not be exploring that world on this walk! Back down the trail we went, meeting again the dog walkers and their critters that we had met on the way up. 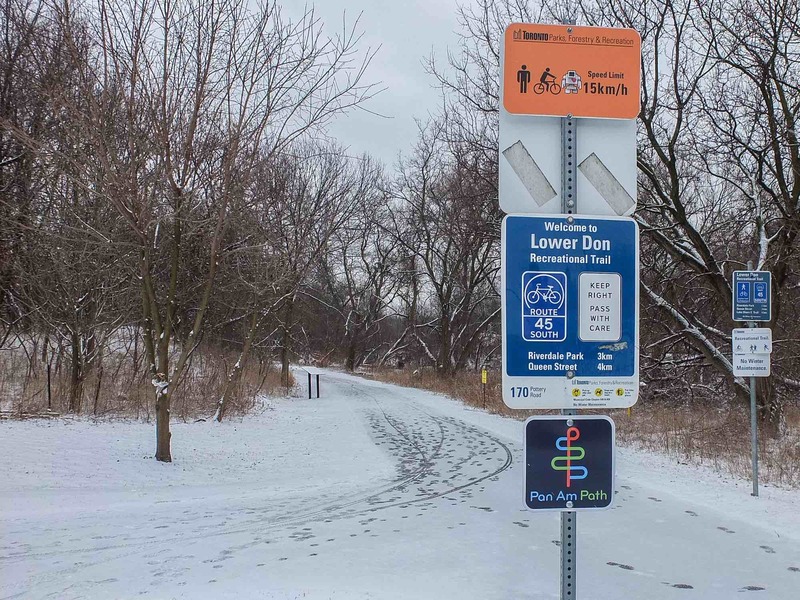 We connected to the Lower Don Bike Trail on the west side of Pottery Road and redid our tracks all the way back home – as the sign indicates, a three-kilometer distance. There were definitely more signs of traffic on the path since we had come up earlier – two bike tire tracks! We would eventually see one cyclist making his way downtown. Viggo was on leash as he sped by. 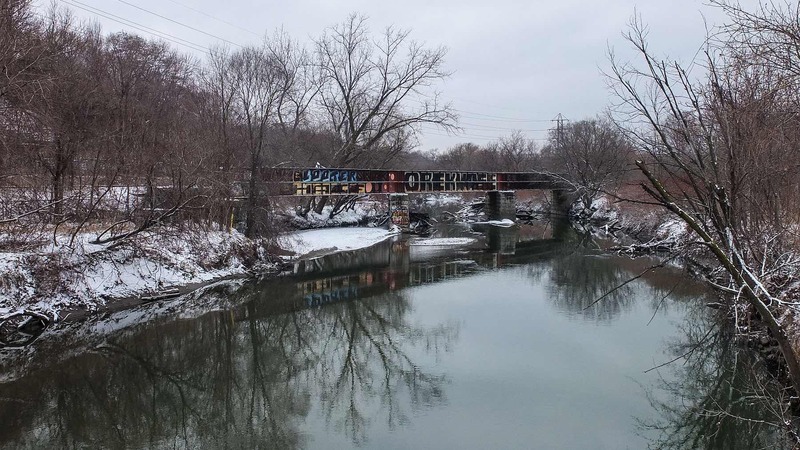 the Lower Don Valley Trail at Pottery Road – 3 km to home! 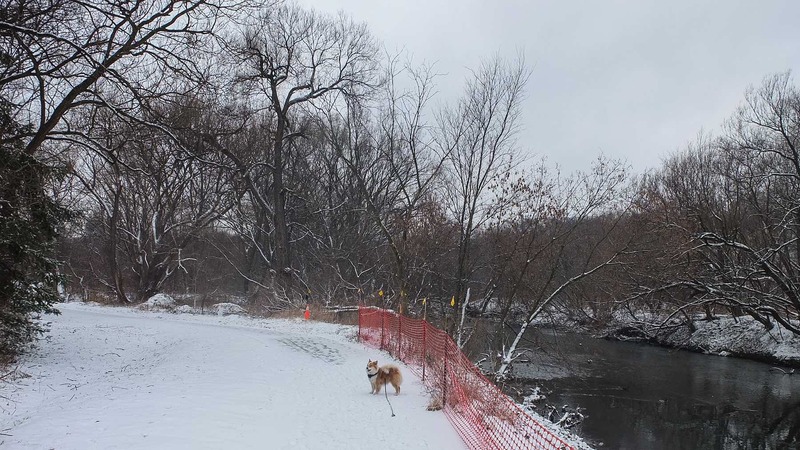 There was a bit of action down in the river that Viggo wanted to check out – a small gathering of ducks seemed to require some herding and he was keen to get the job done. Luckily his treat drive was stronger and he soon came running back to me instead of getting into deep trouble. 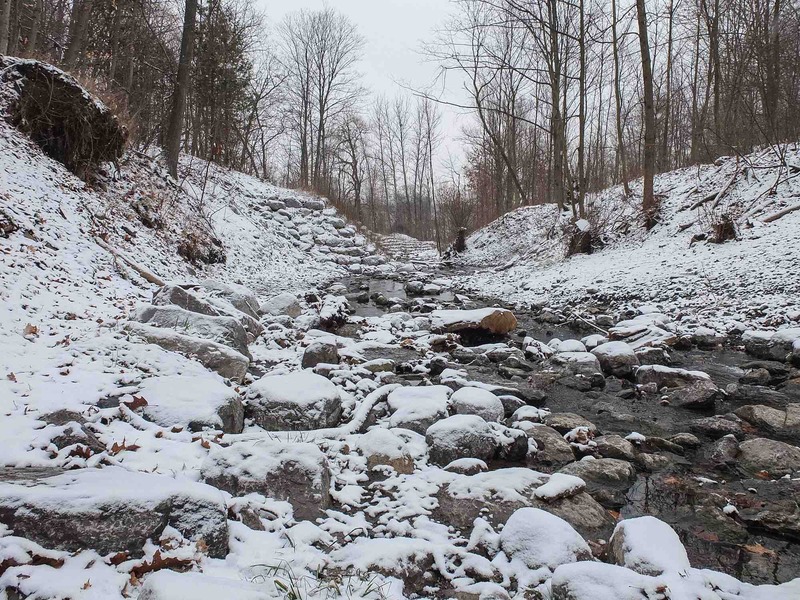 An article on the Brickworks informed me that a massive hobos’ camp was situated just south of the Brickworks in the depths of the 1930’s Great Depression. Hundreds of men camped out on the west side of the Don not far from the pillar in the pic above. We did a small detour to check out the campers in the tent below. The people had been there a month ago. The voices inside again assured me that they were doing okay; they told me this camping trip was only until they were found an apartment. And that was our morning walk. 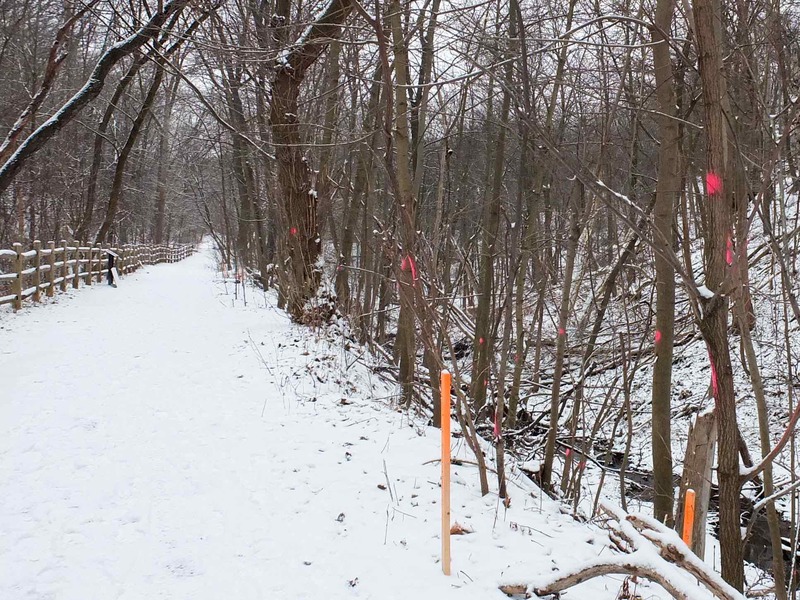 In the pic below you can see those red dots on the ash trees in the wooded area on the east side of the Don River. On top of the snow bank runs Broadview Avenue and the final two-minute walk to our front door. Viggo had a well-deserved nap when we got home and, for a couple of hours, he was pretty relaxed. By mid-afternoon, we had played indoor “fetch” and some tug games. He would get another walk before this day ended – a short thirty-minute spin around the neighbourhood – another day in the life of our dawg! 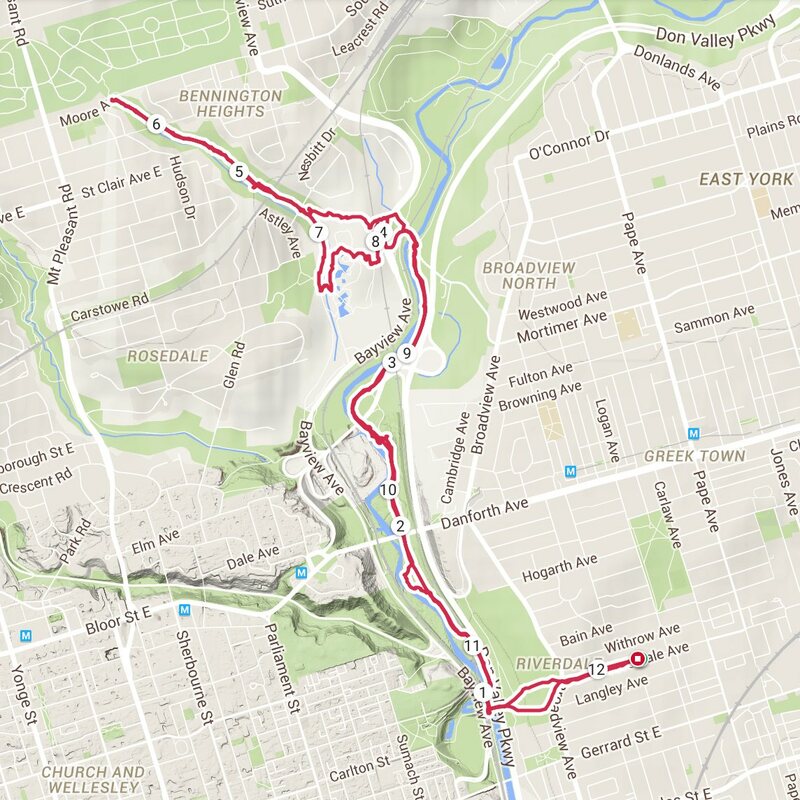 If you want to plan your own Lower Don Valley Trail/Moore Park walk, here is the Google Maps link! A dog is optional! 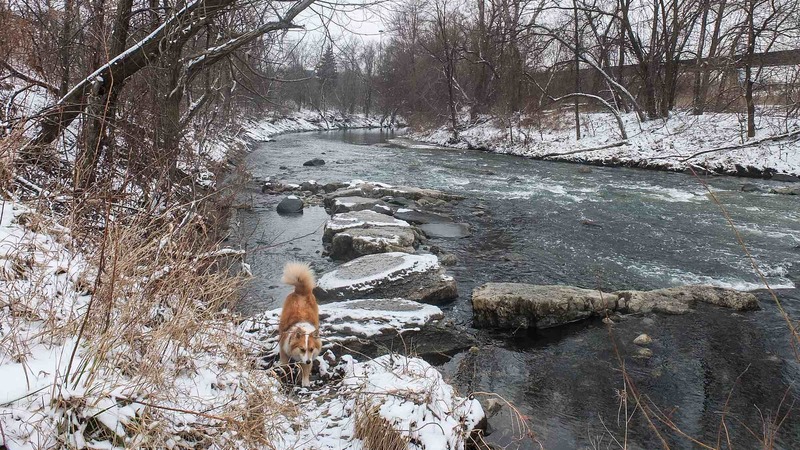 There is public transit to the Brickworks as well as a shuttle bus that takes you up to Broadview Station if you want to do just a part of what Viggo and I covered. 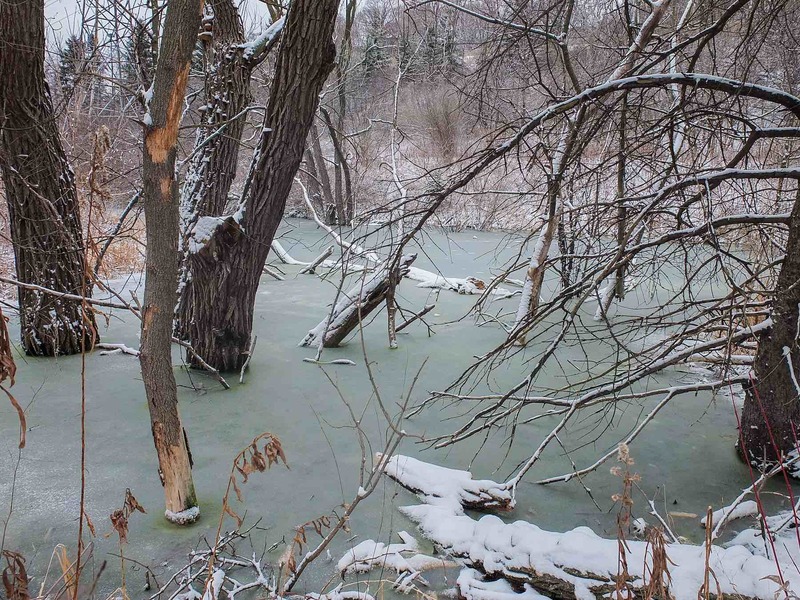 Info and a map of the Mud Creek ravine can be accessed at the lostrivers.ca website here. 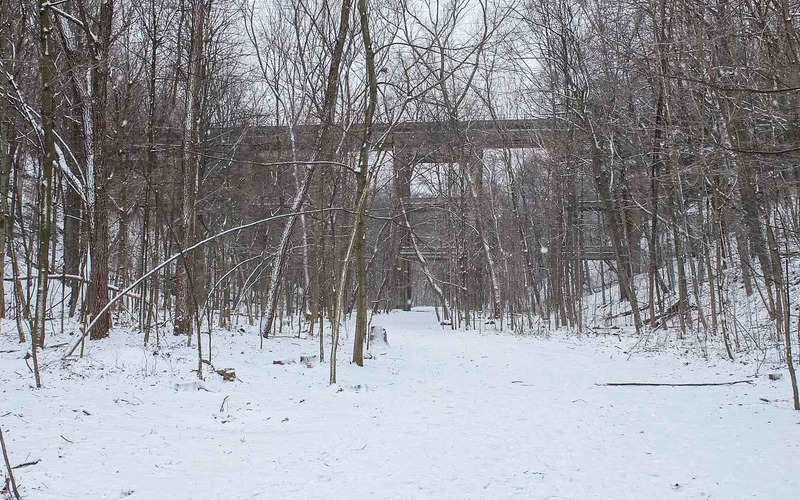 To me, the ravine is one of Toronto’s hidden treasures. I vaguely recall reading that it figures in one or two of Margaret Atwood’s novels. 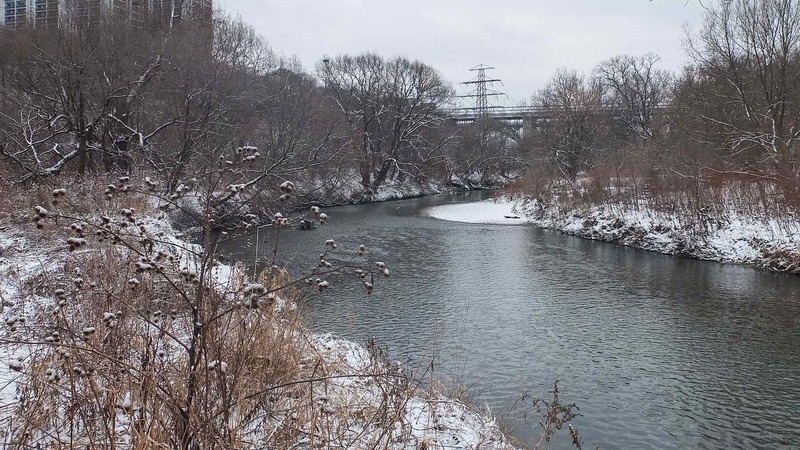 The lostrivers.ca website mentioned above also has a page on the Don River section between Pottery Road and Riverdale. Well-researched and readable, access it here. I did email a “thank you” for the work that someone put into all the material at the site but it may be that nobody is home! The most recent date I found was 2006 – ten years ago. Still, what is out there for us to read and use is appreciated. 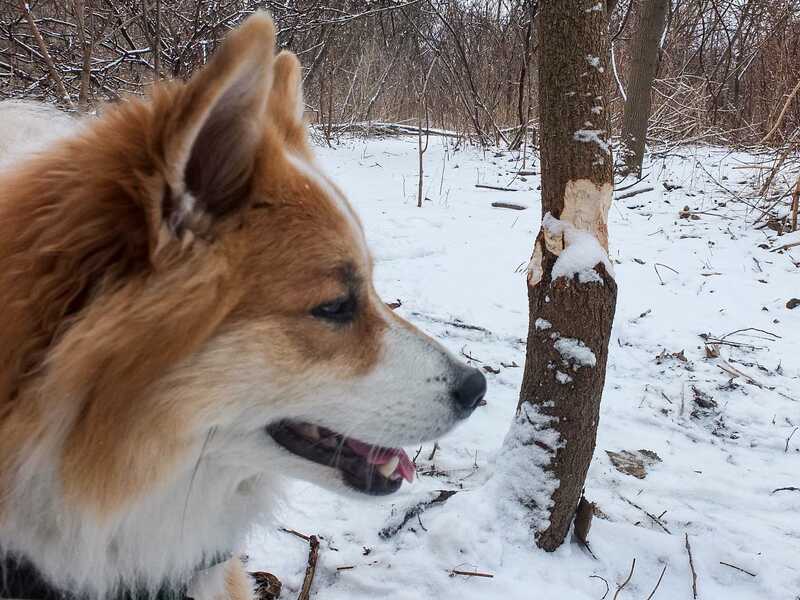 This entry was posted in Ramblin' With Viggo, Toronto and tagged ash tree removal program, Lower Don Valley Trail, Moore Ravine rail tressle, Mud Creek Trail, Toronto dog walks, Valley Brickworks Toronto. Bookmark the permalink. They’re still there? 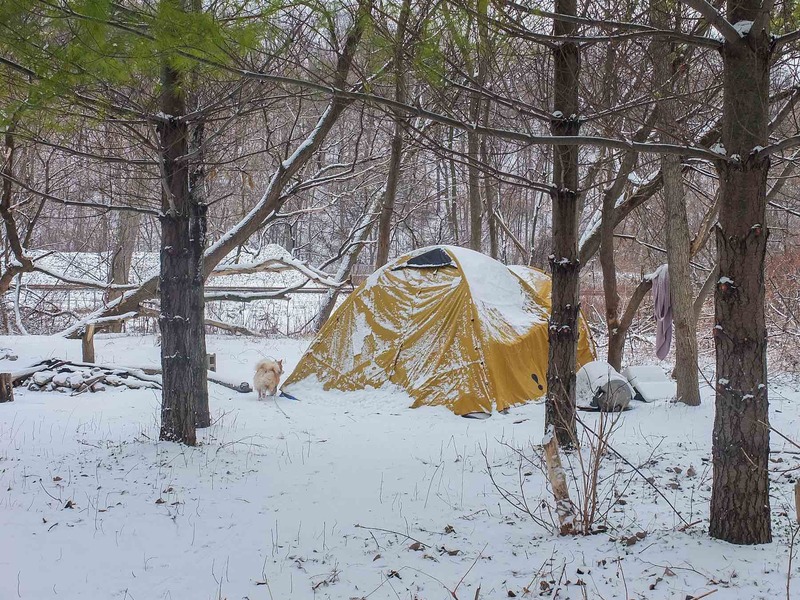 I guess the mind winter has been good to those who are camping out of need. Sadly it seems these coming few days will be more bitter. Also what app do you use for your gps distance tracking? Yup – still there! And as you note the weekend weather will be anything but mild! I am going down there on Friday morning with Viggo and will see how they are doing. Boris, I have a Polar M400 “watch” or fitness monitor or whatever the term is for these devices! It has the gps function as its main feature. It works well as you can see from the map it generated from our walk. It also provides all sorts of other fitness related info that a geek like me finds motivating! You do have to buy the heart rate monitor as well – it is the Polar H7. It goes around your chest and syncs with the watch. The heart rate monitoring is much more accurate than that of watches (like the Apple Watch) that monitor the blood flow in your wrist. You could just get the H7 and pair it with your iPhone which already has gps.